Need an all cotton lavender color dress shirt that has the quality and style that you demand. Try Steven Land shirts. Steven Land not only makes all cotton dress shirts, they also specialize in making a dress shirt that has style as well for the sharp dressed man. You'll see Steven Land shirts on Athletes on TV as well as Celebrities from Hollywood because they know that style counts. 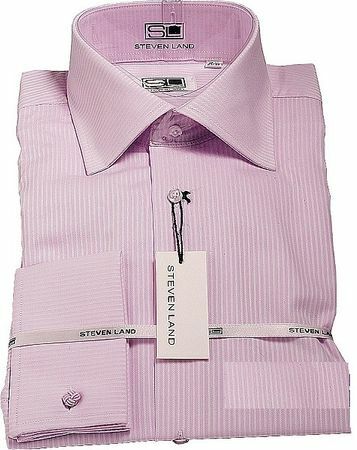 This lavender color Steven Land shirt features a tone on tone fine stripe with a pointed collar and french cuffs ready to slip your favorite cuff links in. Fabric is 100% cotton for the man who demands nothing less than the best.